Looking for a quick and simple supper dish? You won’t go far wrong with this winning combination of sausagemeat and Yorkshire pudding batter! To further tantalise your family’s taste-buds, serve this attractive and satisfying meal with a cheeky little onion sauce. This is one of the bold and beautiful. If you prefer, use ready made sausages instead of sausagemeat. Leave them whole, or cut off the skins and roll up the meat to make the little sausage balls as described below. First of all, place your sausage-meat in a mixing bowl and grate the apple into it. Add the chopped parsley, salt and pepper, then, mix it together thoroughly. With a little flour on your hands, divide and roll the meat mixture into 16 balls. Remove the hot oiled dishes carefully and place four sausage-meat balls in each one. Cook them in the oven like this for about 10 minutes. from the oven and make sure the temperature is still 220C before you pour the batter over the meatballs in each dish. Return the hot dishes with the meatballs and added batter to the oven. Cook without opening the oven door for 35-40 minutes. As the sausage Yorkshire popovers are cooking, prepare the onion sauce. Melt the butter in a pan and gently fry the onion until it softens and just begins to colour. Stir in the dried mustard powder and 1 level tablespoon of plain flour. Cook this gently for 1-2 minutes. Keep stirring. 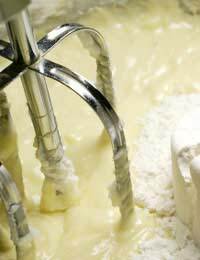 Remove the pan from the heat and add the 300mls of milk, a little at a time, stirring with each addition. Use a fork or whisk if preferred. Return the pan to a low heat and stir well until the sauce is thicker and the only lumps that remain are onion slices! When the sausage Yorkshires are well risen and golden brown, remove them from the oven. Pour a little of the onion sauce in the centre of each portion and serve immediately. This dish is a substantial meal on its own; but if you want more colour - and more than one of your five a day veggie portions - serve with cabbage, peas, carrots and gravy. Many kids love to spoon their vegetables into the Yorkshire and cover the whole thing with gravy, a great way of eating vegetables up! For the truly ravenous, mashed potatoes can also be served with these popovers.